[Episcopal News Service – Havana, Cuba] The Episcopal Church of Cuba has a clear vision moving into its next triennium: to be a church united in diversity, celebration, evangelism, teaching, serving and sharing the love of God. Arriving at that vision has been “a very rich experience,” yet at times “somewhat difficult,” said Bishop Griselda Delgado Del Carpio, during a post-General Synod interview with Episcopal News Service on Feb. 23. At the close of the last three years, Delgado’s first full triennium serving as bishop, a clearer vision for the church began to develop, with evangelism taking center stage in the church’s mission, she said. “From there we could visualize a concrete plan that we have to work from,” she added. achieving better communication across the church. 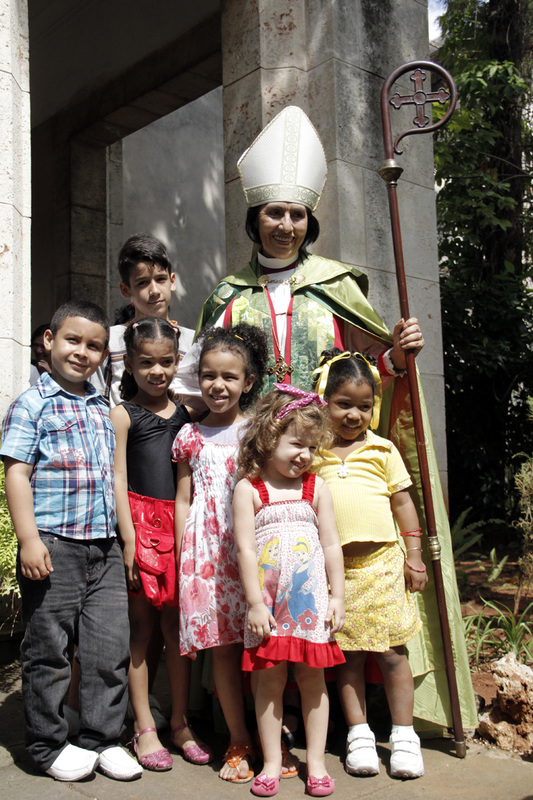 Griselda Delgado Del Carpio poses with children following the General Synod’s closing Eucharist. The church in Cuba’s three-year plan prioritizes the formation of children. Photo: Lynette Wilson/Episcopal News ServiceIt’s for that reason, she added, that the plan focuses on the formation of young people, children and adolescents and also those on the path toward priesthood who will inherit big responsibilities. “I continue to be amazed at the tenacity and missional heart of the Episcopal Church in Cuba,” said Presiding Bishop Katharine Jefferts Schori in an e-mail to ENS. 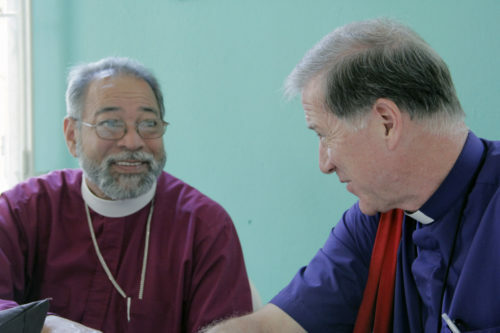 The Episcopal Church of Cuba’s annual General Synod, held Feb. 21-23 at Trinity Cathedral in Havana, was attended by Episcopalians and Anglicans from the United States and Canada, including Archbishop Fred Hiltz, primate of the Anglican Church of Canada. 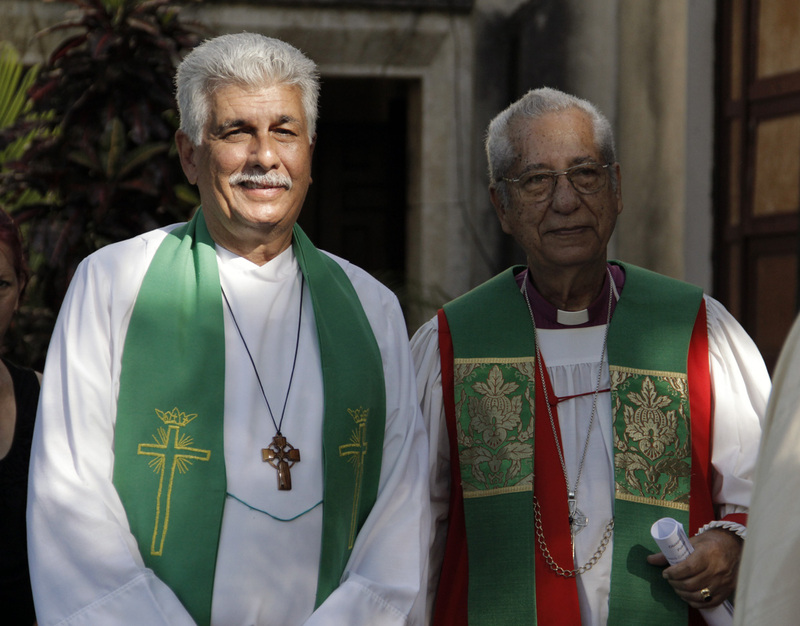 Delgado was installed in November 2010, replacing Bishop Miguel Tamayo of the Anglican Church of Uruguay who served the church as an interim bishop for six years, splitting his time between Montevideo and Havana. 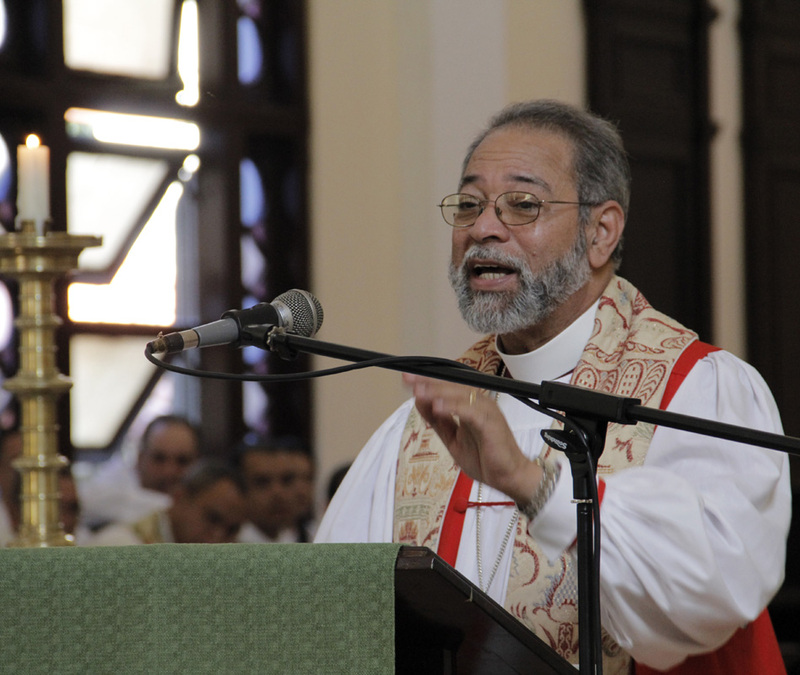 Following Delgado’s election, Dominican Republic Bishop Julio César Holguín became her mentor for three years, a relationship that continues informally today. Holguín led a small delegation, including members of companion dioceses, to Cuba Feb. 18-25, to attend General Synod. The Diocese of the Dominican Republic has some 15 U.S.-based companion diocese relationships, and itself serves as a companion to the church in Cuba, though in a more informal, “sentimental” way as an expression of solidarity, said Holguín. But the relationship also has taken on a practical nature, for example in 2009 the Episcopal Church’s General Convention initiated $23 million in budget cuts necessitated by declining revenue, which meant a decrease in grants to Province IX dioceses and the church’s covenant partners, including Cuba. Following that action, the clergy in the Diocese of the Dominican Republic committed to giving 1 percent of their salaries, which amounts to about $3,000 total, to be shared by the clergy in Cuba, said Holguín, adding that the monthly salary for clergy might be $7 or $8. “We were in a better position than anyone to support the church in Cuba,” he said. The Episcopal Church’s triennial budget allocates $106,000 to the church in Cuba. Like the U.S.-based Episcopal Church, the Anglican Church of Canada has had a longstanding relationship with the Episcopal Church of Cuba, said Hiltz. 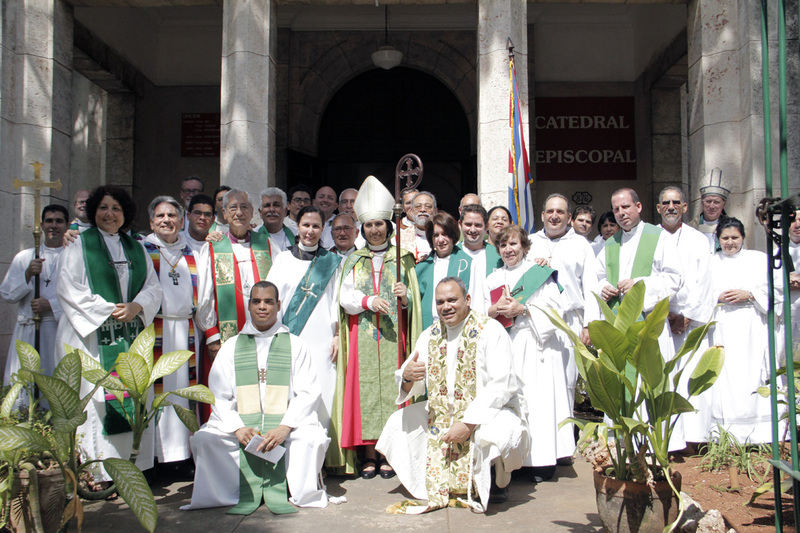 The Episcopal Church of Cuba is an autonomous diocese of the Anglican Communion under the authority of the Metropolitan Council of Cuba. The council is chaired by Hiltz and includes Jefferts Schori and Archbishop of the West Indies John Holder. The council has overseen the church in Cuba since it separated from the U.S.-based Episcopal Church in 1967. In the six- and-a half years that Hiltz has served on the council, he said, despite the continued hardship, he’s sees a lot of hope in the church, as well as a push toward leadership development. 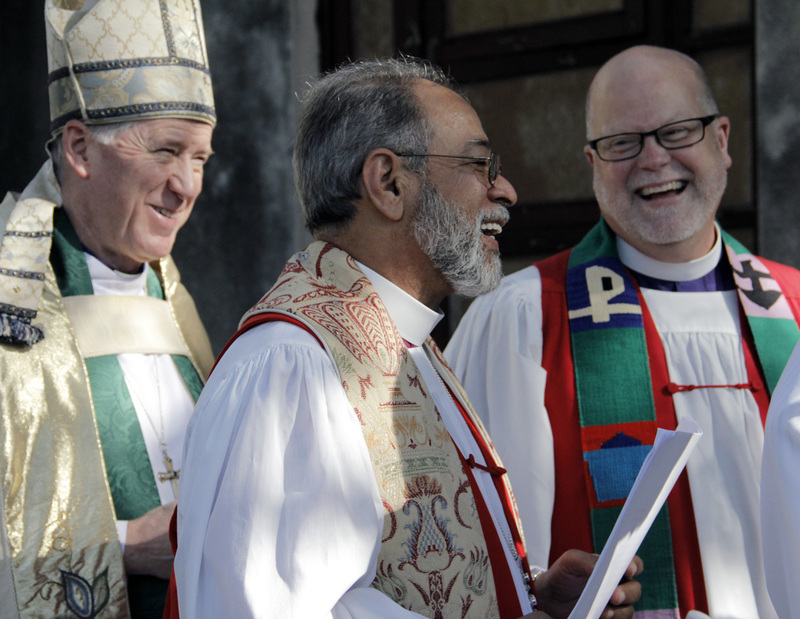 Having a full-time bishop has helped, he added. “The church here in Cuba is not an institution, but a movement, a gospel movement,” said Hiltz. The Sunday prior to the convention, Feb. 16, Hiltz and other visitors from the Anglican Church of Canada visited a house church in Luyano, a poor section of Havana, where the packed congregation celebrated Valentine’s Day by exchanging practical gifts of soap and toothpaste, two necessities that can be difficult to come by in Cuba. Following the Eucharist, the congregation led the group to the building site of their church, which after being destroyed 30 years earlier by a hurricane is being readied for an Easter Sunday consecration. Rather than just build a place of worship, however, Hiltz said, the temple includes medical and elder-care clinics and a community center. In offering prayer, context makes a difference, he added. In the Anglican Church of Canada’s Diocese of Niagara, the 91 parishes pray weekly for the churches in Cuba, said Bishop Michael Bird, when introduced to the synod. 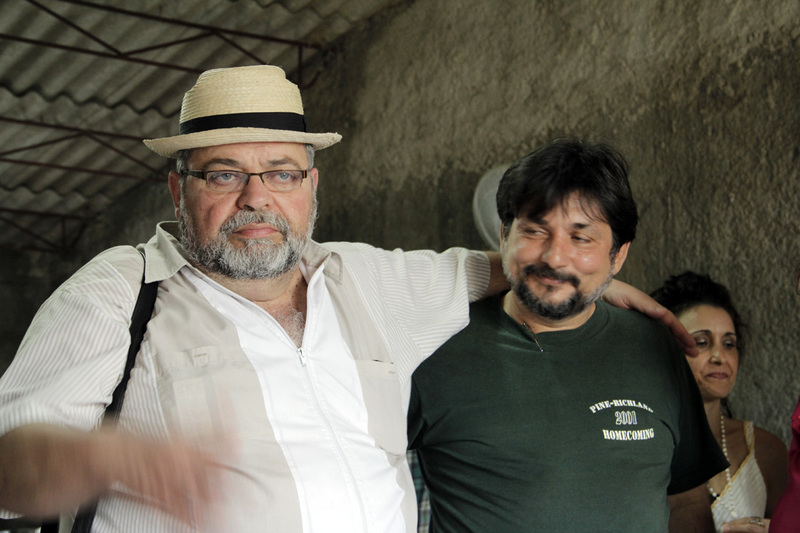 The Canadian church provides support for the Cuban church through program support, clergy and seminary faculty stipends and through diocesan companion relationships. The Diocese of Niagara, for example, recently renewed its decade-long companion diocese relationship with the church in Cuba for another five years. “Cuba is kind of a special diocese in the Anglican Communion, and our partnership is a way of expressing solidarity and friendship; a grassroots expression of that,” said the Rev. Bill Mous, the diocese’s director of justice, community and global ministries. The Episcopal Church of Cuba traces its origins back to an Anglican presence beginning in 1901. Today there are some 46 congregations and missions serving 10,000 members and the wider communities. During the 1960s, Fidel Castro’s government began cracking down on religion, jailing religious leaders and believers, and it wasn’t until the Pope John Paul II’s 1998 visit to Cuba, the first ever visit by a Roman Catholic pope to the island, that the government began a move back toward tolerance of religion. The Cuban Revolution, led by Castro, began in 1953 and lasted until President Fulgencio Batista was forced from power in 1959. Batista’s anti-communist, authoritarian government was replaced with a socialist state, which in 1965 aligned itself with the communist party. In 2008 Raul Castro replaced as president his ailing brother. What struck Diocese of Eastern Michigan Bishop Todd Ousley most was the uniquely Cuban way of being Anglican. “What was most striking to me was the sense of how they strategically contextualize the church by very carefully honoring their Cuban culture and melding that with Anglicanism,” he said, adding that it’s clear from the strategic plan that not only the leadership of the bishop is important, but also that of the clergy and the laity. The Cuban church’s experience with socialism and its understanding that everyone must work together in solidarity serves as a good model for the church in North and Latin America, said Ousley. Overlapping with the start of the church’s General Synod, a diverse Anglican-Episcopal mission group – including people from the United States, Mexico, Argentina, Chile, El Salvador – visited St. Francisco de Assisi Church in Cárdenas, in Matanzas Province, about a two hours’ drive east of Havana. The group was led by the Rev. Canon Juan Andrés Quevedo, rector of the Church of the Redeemer in Astoria, Queens, and an archdeacon in the Diocese of Long Island. It was the first time in 13 years that Quevedo, who was born in the city of Matanzas and who attended the local evangelical seminary before studying at Trinity College in Toronto, Canada, had been back in Cuba. In the grass alongside St. Francisco de Assisi cinderblocks were neatly arranged in rows, almost like headstones in a cemetery, only they were there to keep the church’s newly sanded and stained pews from touching the grass. The mission group needed a service project to be completed within a week so, along with the Rev. Aurelio de la Paz Cot, they decided it would be best to refinish the pews, and to passersby the neatly arranged cinderblocks and the drying pews looked curious. And more than that, for de la Paz it was a “marvelous experience” and it meant a lot for him and his congregation that people would use their vacation time and their personal resources to come to Cuba, to learn about its culture and its people and share something of themselves, with people who are otherwise somewhat isolated. For those who traveled to the island, the experience was at the same time one of both joy and pain, said Quevedo, with many comparing their own country’s experience with totalitarian regimes and high levels of poverty. “They have seen a side of poverty not familiar to them,” he said, during a visit to an organic farm near Cádenas run by the Christian Center for Reflection and Dialogue. That self-awareness also can be seen in the way the church operates in Cuba. “It’s a very cultural church, rooted in the history of Cuba,” said Carlos Austin, a second-year seminarian from the Episcopal Church of Panama. The church has strong leadership, he said, but one of its most defining characteristics is its youth presence. As a seminarian at Evangelical Theological Seminary in Matanzas, Austin spends his weekends serving Cuatro Esquinas, a church in Los Arabos, a community some 65 miles away. “They are an example of what a church should do community-wise,” said Austin, adding that the church serves as a community center and dispenses medicines and purified water. “The priest and the leadership are seen as helpers; where I come from we [the church] have to learn more about the community. It was the Rt. Rev. Julio Murray, bishop of Panama, who decided Austin would attend seminary in Cuba, rather than in Brazil, Austin’s other alternative. He’s one of 17 resident seminarians; the school has 500 distance-learning students across Cuba. The bishop wanted Austin to study theology in the Latin-American context, and for Austin, at least in the beginning, it was difficult because everyday life in Cuba requires fortitude. Public transportation in Cuba is limited and it can take hours to cover short distances; basic goods like toilet paper, soap and toothpaste can be difficult to come by, regardless of whether you have the money or not to buy them; salaries are low, with doctors earning less than $20 a month. If not for the kindness of church members, Austin said, he would have left. “That’s what’s made the difference for me here, the church and the people took me in,” he said. — Lynette Wilson is an editor/reporter for the Episcopal News Service. 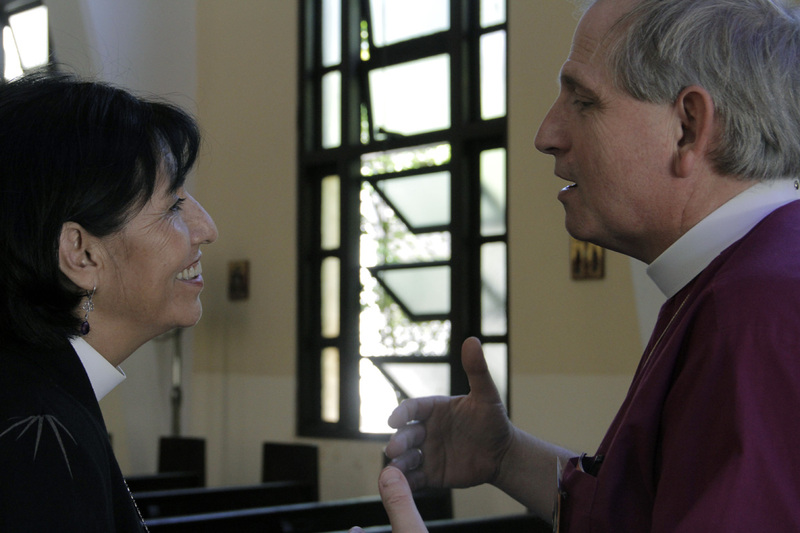 She traveled to Cuba Feb. 18-25 with a delegation led by Dominican Republic Bishop Julio César Holguín. Congratulations to Bishop Griselda and the people she serves. She is wonderful! I agree with you, Father Al. La Obispa Griselda is a gift from God to Cuba and a blessing for us in America as she diligently but gracefully works to bring our peoples together into the dialogue of Christ’s Love. Congratulations on a successful third Synod! Godspeed with a flourishing future for the Church in Cuba. I traveled to Cuba with the Episcopal Diocese of Southeast Florida a few years ago and attended a sunday service at the Cathedral. I still remember the a cappella allelujia that was sung during the peace. Can someone please share the music as we would like to replicate it at some point with our choir. It was just amazing!